Bangladesh is a green low-lying, riverine, delta plain country located in South Asia with a largely forests and coastline of 710 kilometers (440 mi) on the northern of the Bay of Bengal. Bangladesh formed by a delta plain at the confluence of the Ganges (Padma), Brahmaputra (Jamuna), and Meghna Rivers and their tributaries, alluvial soil is highly fertile, but vulnerable to flood and drought. Chittagong Hill Tracks are covered with Hills in the southeast and Hills are arise in Sylhet division in the northeast. Bangladesh has a tropical monsoon climate characterized by heavy seasonal rainfall, high temperatures, and high humidity. Natural disasters, such as floods, tornadoes, and tidal bores affect the country every year. Bangladesh also is affected by major cyclones. One cyclone struck the southeastern coast in May 1991, killing 136,000 people. The cyclone Sidr struck the southwestern coast on November 15, 2007 affecting not only the coastal districts of the administrative division Khulna but also about half of the tropical forest Sundarbans. The country has an area of 144,573 square kilometers and extends 820 kilometers north to south and 600 kilometers east to west. Bangladesh is bordered on the west, north, and east by a 2,400-kilometer land frontier with India and, in the southeast, by a short land and water frontier (193 km) with Burma (Myanmar). On the south is a highly irregular deltaic coastline of about 580 kilometers, fissured by many rivers and streams flowing into the Bay of Bengal. The territorial waters of Bangladesh extend 12 nautical miles (22 km), and the exclusive economic zone of the country is 200 nautical miles (370 km). Roughly 80 % of the landmass is made up of fertile alluvial lowland called the Bangladesh Plain. The plain is part of the larger Plain of Bengal, which is sometimes called the Lower Gangetic Plain. Although altitudes up to 105 meters above sea level occur in the northern part of the plain, most elevations are less than 10 meters above sea level; elevations decrease in the coastal south. About 67% of Bangladesh’s nonurban land is arable. Permanent crops cover only 2%, meadows and pastures cover 4%, and forests and woodland cover about 16%. The country produces large quantities of quality timber, bamboo, and sugarcane. Bamboo grows in almost all areas, but high-quality timber grows mostly in the highland valleys. Rubber planting in the hilly regions of the country was undertaken in the 1980s, and rubber extraction had started by the end of the decade. 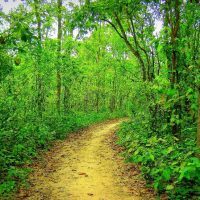 A variety of wild animals are found in the forest areas, such as in the Sundarbans on the southwest coast, which is the home of the world-famous Royal Bengal Tiger.